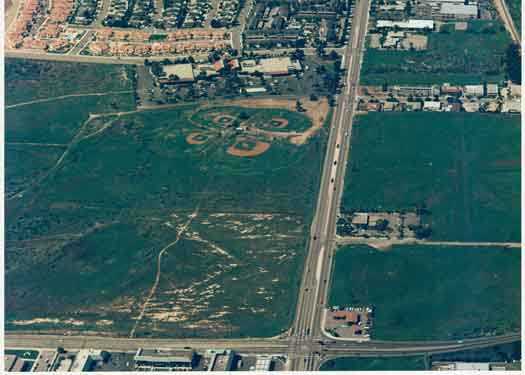 The original Dos Pueblos Little League Fields closed in 1997 for the construction of the Marketplace Shopping Center. 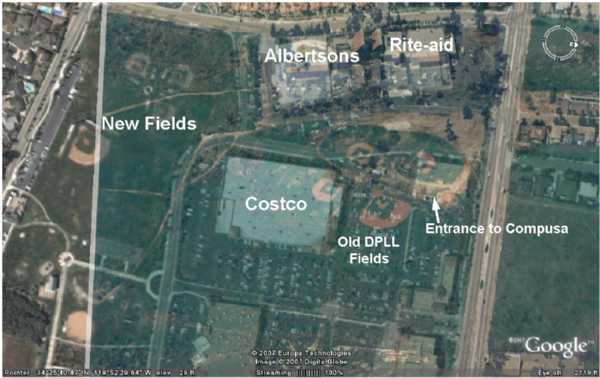 Overlay photo showing the old Dos Pueblos Little League Fields and the new shopping center. In the first year (1974), all DPLL games were played at Goleta Valley Jr. High School. There were only two divisions, Minor and Major. The Major division played on the northwest corner of the north field (by the gate next to Cathedral Oaks) and the Minor division played on the south West side of the same field. There were temporary ropes placed as homerun fences. Sometimes, the ball would roll through the fence in one game and roll into the other divisional game. On the first opening day we took pictures then played a couple of innings. I think Duke Windsor scored the first run for the league. The players were outfitted in full white button up baseball uniforms with the team logo. The original DP logo on the hats had the D and P letters separated (D P), not together as today. In the second year, DPLL received permission to build baseball fields where the Camino Real Center Best Buy parking lot is currently located. Numerous parents joined together, utilizing various backgrounds to design, procure, and build the first generation DPLL fields. There were welders, gardeners, engineers, and maintenance experts all contributing their free time to help create DPLL’s first home field. Companies around Goleta were donating material and equipment. Vista steel supplied some fencing and poles for the backstops, including welders. In one day we welded together three backstops in the Thrifty’s (now Pacific Sales) parking lot by noon. We had to be done by noon because a volunteer brought in a crane that afternoon to lift the backstops into their footings. This was all done under the threat of rain, but luckily we finished in time. On another day I remember an Edison employee showing up and installing a telephone pole complete with electricity for the snack shop. There were several other Saturdays where numerous people got together attached the outfield fencing, planted grass, and hauled the material for the infield base paths. It was amazing how much volunteer work was put into creating the fields. The league was growing, boasting three divisions (Minor, Major, and Senior). The Coast division was soon to follow. The Senior division field was not ready until the following year. Thus, the Senior division games that year were held at Dos Pueblos High School. “We built it, and they came.” That second year, we all came together to celebrate the new home for DPLL. The fields were beautiful. Early every Saturday I remember borrowing a ride-on lawn mower from UCSB to mow the outfields, while other parents used push mowers on the infield. My son’s Mike and Gary would prepare the fields for the games every day in those first five years. They remember using a fire hose to water the grass. Borrowing the infield drag from DP Coach Scott O’Leary and pulling it with my truck. Driving to Jack in the Box to pick up donated ice for the snack shack, and raking and laying down the chalk lines. They were happy when the league eventually bought a lawn tractor to drag the fields. Over time the fields were improved to include score boards and a sprinkler system. Other memories include taking the team over to Pizza Hut (located where Baja Fresh stands today), or Shakey’s (by the Airport) to celebrate victories and end of the year parties. The fields were home to DPLL for over twenty years until 1997, when the Camino Real shopping center was created and DPLL moved to its new home at Girsh Park. I would like to thank all of the people that donated numerous hours over the years to make this league what it is today, one of the finest leagues around.